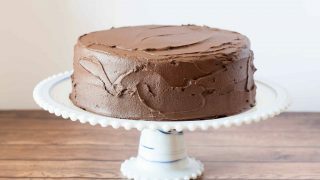 Gluten Free Yellow Cake with Chocolate Fudge Frosting has a moist and tender crumb with creamy chocolate fudge frosting. 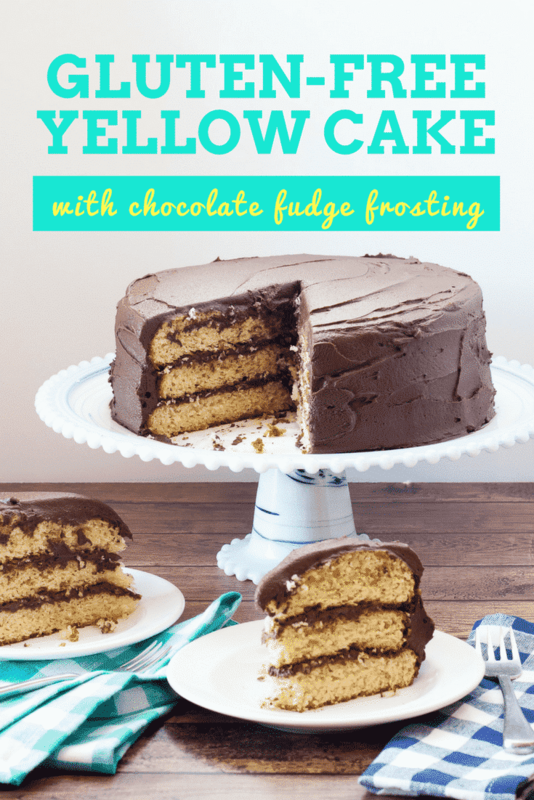 Whether you bake it in a layer cake, or sheet cake, or cupcakes, it is a crowd pleasing gluten free yellow cake recipe that always gets rave reviews! Featured in Cake Central Magazine. I baked this gluten free yellow cake with chocolate frosting for my daughter’s first birthday. Everyone was astounded that the cake was gluten free! The cake itself has a perfect moist crumb. It isn’t dense or gummy and it bounced back when I cut into it, which is almost unheard of for gluten free cakes. A classic chocolate fudge frosting is the perfect accompaniment. Creamy, fluffy American buttercream with rich melted semisweet chocolate and dark cocoa powder whipped in. Together, they make the perfect cake for celebrating all of life’s special moments. I have since made this gluten free yellow cake for many birthday parties and other special moments. 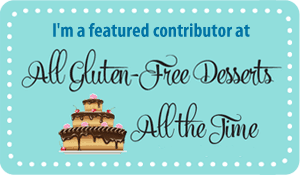 It is always a hit, just like my gluten free rainbow cake and gluten free red velvet cake. One of my favorite parts of my birthday as a young child was getting a big package in the mail from my grandma. My grandma lived more than a thousand miles away, so she would send me and my sisters each our own birthday package when we were little. My family had the only grand kids that didn’t live nearby, so instead of having a cake and presents at her house she’d send us everything we needed in a package. Baking my own birthday cake from my grandma’s package definitely inspired my love of baking. As my dietary needs have changed, the cakes I bake have changed too. 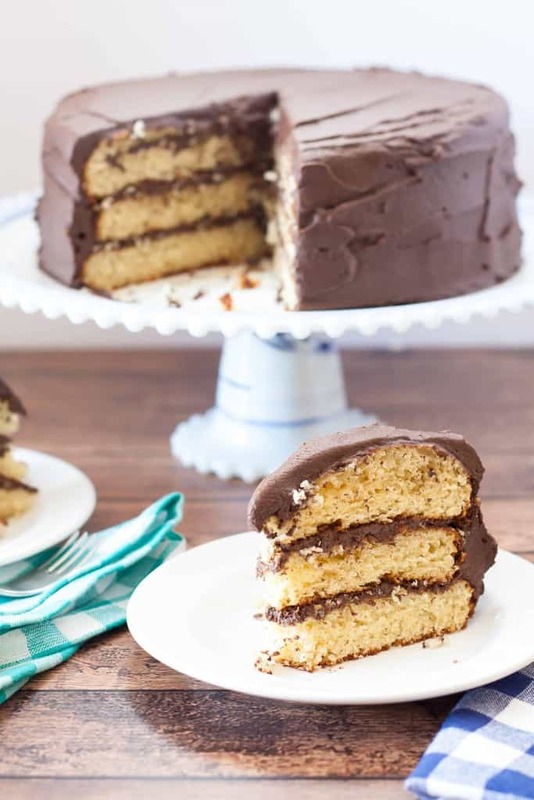 I think of this gluten free yellow cake with fudge frosting as a homemade version of one of the cakes my grandma would mail me the mix for. We loved baking and frosting our birthday cake all by ourselves, using what she sent us in the package. We still all make our own birthday cake, which surprises a lot of people. It is something we always look forward to, and we all try to out-do the last sister’s birthday cake. It is really special to me that my grandma made such an effort to participate in our birthdays, even though she lived so far away. I think of her every time I make a birthday cake for my girls! I originally developed and wrote this recipe for Cake Central. It was featured in the July 2016 issue. 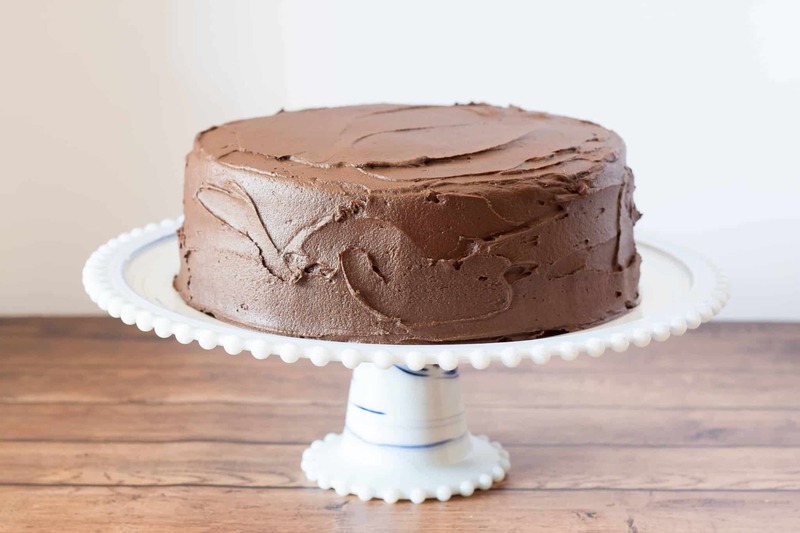 Gluten-Free Yellow Cake with Chocolate Fudge Frosting has a moist and tender cake with creamy chocolate fudge frosting. 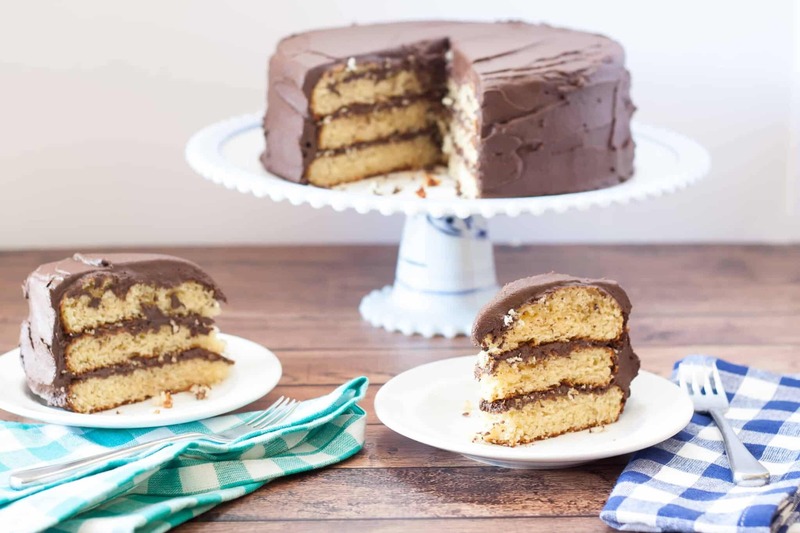 Whether you bake it in a layer cake, or sheet cake, or cupcakes, it is a crowd pleasing gluten-free yellow cake recipe that always gets rave reviews! Preheat the oven to 350F. Prepare (2) 9x3 inch round cake pans or (3) 9x2 inch cake pans*** by lightly greasing them and lining the bottom of the pan with a 9 inch round of parchment paper. Alternatively you could flour the pans with some additional gluten-free flour. Sift the gluten-free flour, sugar, xanthan gum, baking powder, baking soda, and salt into a mixing bowl. In a small bowl or large measuring cup whisk together the buttermilk, oil, vanilla, whole eggs and egg yolks. Bake in the preheated oven until a toothpick inserted near the center comes out almost clean, with maybe a few crumbs on it. When baking 2 layers it took me 27-30 minutes and when baking 3 layers it took 18-20 minutes. Let the cakes cool completely before frosting with the chocolate fudge frosting. In a small bowl whisk together the cocoa powder and hot water into a smooth paste. Set aside and let cool completely. In a stand mixer or with hand-held electric beaters, whip the butter until light and fluffy, about 5 minutes. Add the powdered sugar and milk or cream and beat at a lower speed until combined. Then whip at a higher speed for another 2-3 minutes. Add the cooled cocoa paste and cooled melted chocolate and mix until evenly combined. *Measuring flour by weight is much more accurate, so if you have a scale use it. If you don’t, gently spoon the flour into the measuring cup and then level off with the back of a knife. Don’t scoop or pack it in. For best results use Gluten-Free Mama’s Almond Flour Blend. It gave it the perfect crumb and texture, like nothing I’ve ever seen before and I’ve been baking gluten-free for years. I also baked this cake with my own gluten-free cake flour blend with great results! You should also get great results withGF Jules Gluten-Free Flour. 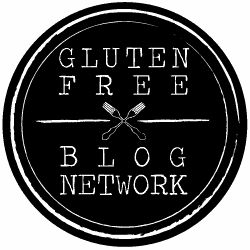 Not all flour gluten-free blends are created equal and unfortunately you will not get good results with all gluten-free flour blends. **Instead of buttermilk I put 1 tablespoon of vinegar in my measuring cup and then added enough milk to make 1 ¼ cups. Let it sit at room temperature for at least 5-10 minutes before using. *** My 9 inch cake pans are only about 2 inches tall. Baking the cake in (2) 9x2 pans, the cake rose too high and didn’t bake evenly. If your pans are 3 inches tall you can bake your cake in 2 pans, otherwise I suggest baking your cake into 3 layers. I've also baked this cake as a sheet pan and cupcakes. Adjust the baking time to about 30-40 minutes for a 9x13 pan, and about 18-25 for cupcakes. Baking times vary, just cook until a toothpick comes out clean with just a small crumbs. **** To make vegan, I've baked this recipe using an egg substitute. I used egg substitue equal to 4 eggs instead of both the whole eggs and egg yolks. You can likewise use dairy-free milk to make the frosting and buttermilk, use vegan butter or palm shortening in the frosting and use vegan/dairy free chocolate. My go-to is a flax egg (1 Tablespoon Flax Meal mixed with 3 Tablespoons hot water) but I think when I tested this recipe I used Bob’s Red Mill Egg Replacer. If I remember correctly, the texture was very similar to a flax egg. I will note that the cake won’t be as moist, since it will be missing some of the extra fat from the egg yolks. It also won’t be as “yellow” since that is where much of the color comes from too. Will this recipe work for cupcakes as well? Absolutely! I’ve used it to make cupcakes several times. Fill your cupcake tins about 3/4 full and cook until a toothpick inserted in a cupcake comes out mostly clean and the cupcake springs back (doesn’t leave an indentation) when you lightly touch it with your finger.